A quick note before we begin. This album was released in 2015 by the Italian label Nightbreaker Productions at about 1000 copies. While re-releasing albums is not a new phenomenon, the fact this album is being re-released independently is odd. Perhaps the band was unhappy with the initial run or 2018 ft more into their idea of cosmic devour. Whatever the case, Nex Carnis is giving their debut another spin, on their own merits, and with the year of 2018. With punishing sounds of old school death, who am I or anyone else to argue? One of the more relaxing things about Nex Carnis is the fact they are from a place not known for its metal scene but also exceptional in their field. Researching global metal can bring one to bands that are from exotic places yet with mediocre sounds. The embrace of the location rather than the sound can be troublesome when documenting heavy metal from non western countries as one can fall in love with an idea rather than reality. Nex Carnis does everyone a favor with greeting everyone with pulverizing death metal that could be at home in any warehouse, dive bar, or putrid cemetery. While death metal is currently experiencing a surge in hipness, Obscure Visions of Dark has both the cooleness of the current sound combined with unique variations to make them stand out of a ghastly crowd. 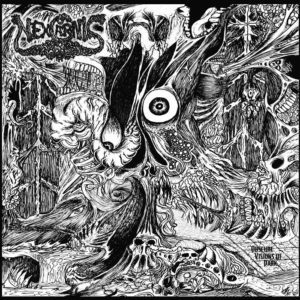 With song titles ripped from the 90’s and artwork that could fit perfectly on a tape, Obscure Visions of Dark not only stands as model for current death but also makes the whole thing fun as hell to listen to. Open coffins and welcome welcome the swarm of darkness.